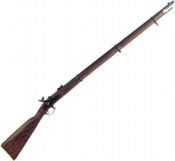 See details Model 1892 Lever Action Rifle. Western Lever Action M1866 Brass Rifle Yellow Boy: Legendary Old West rifle. Lever action works just like original. Looks great over the fireplace. Length: 39.5 Weight: 6.6 lbs.